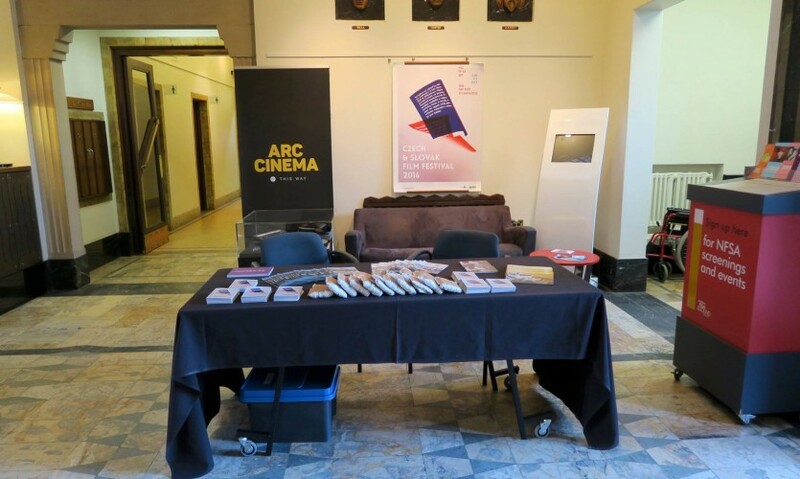 Esteemed Australian historian and author Humphrey McQueen recently attended the Czech and Slovak Film Festival when it visited the National Film and Sound Archive in Canberra in October. Humphrey was kind enough to share his thoughts with us on the festival by way of his correspondence to good friend Peter Lyssiotis, a poet and artist bookmaker in Melbourne with whom he shares a great love of cinema and writing letters. No sooner had we seen the schedule at the ARC in Canberra than we realised that we faced another lost weekend, and booked for all six. Before we got to opening night we were encouraged by the thought that you were going too. We began with The Noonday Witch, which I have to admit was the one which did the least for us. I scare easily but was not at all on edge. It was several times less scary inside the farmhouse than the haunting in the recent Australian film, The Babadook, also about an absent father. That softness was compensated for in The Noonday Witch by setting the mother and child in a vibrant community, which had its own sources of alarm as well as of comfort. I came out thinking that the mother and girl would get over the father’s suicide and the mother’s lies. The deep terror in The Babadook is that the mother and child were locked forever in their comforting madness. No wonder it flopped at the local box office. Australians aren’t up for the tough stuff, least of all about ourselves – think of how the magnificent Snowtown disappeared. The Seven Ravens is endlessly inventive with the stuff of a standard folktale. If it were in English, and had the usual Hollywood $10m. promotional budget, it would top the box-office charts. But so many people won’t – not can’t – read subtitles. The Seven Ravens works because it presents the fairytale characters as people and not CGI cutouts. Everyone should get to see it – I suppose that dubbing must have improved since the Spag Westerns so that that solution is infinitely preferable to letting Disney remake it. Dragon’s Return has the appeal of an unfamiliar landscape against which tell another standard village drama. If there is a ‘message’, it is that community is no guarantee of human warmth – as Goethe spelt out for Marguerite. It is Dragon who has the most to revenge yet he has grown past it – perhaps never harboured much of it – possibly because he always had the satisfaction of making pots. Lost in Munich escaped from the device of the parrot’s recalling what French premier Daladier had really thought of the Czechs – which was the same as Australian Prime Minister Menzies did – a little people causing unnecessary worries to that nice Mr Hitler. The history lesson is not one that I had encountered and am never going to have time to check out for myself. In terms of presenting the lunacy of ever trying to make a movie about anything and of how to make a movie about arcane texts, the directors found their way out of Munich. My prime reservation is that the version of events that they offer suffers from the fallacy that anyone can know what is going to happen seven years hence – just like the nonsense about Hitler’s carrying out a step-by-step plan set out in Mein Kampf – a view supportable by not reading it and by knowing nothing about what he did do. In the cinema, a good time was had by all moving from farce to tragedy. Eva Nova is performance-driven, and not just by the protagonist. However, their roles, large or walk-out, depend on the comprehensive storytelling of the director. Viewing the family from the safe space of a theatre, I wanted the son to help his mother from the start, yet we know from – thankfully – the lives of others, that damage done in childhood can make the clichés of ‘moving on’ and ‘putting that behind you’ almost as heartless as the initial harms. So the daughter-in-law’s escape with the two kids and the final resolution – final in the film though unlikely to be conclusive for the characters’ afterlives – is as close to a happy ending as life ever comes and no closer than storytelling should allow. We’d go again if it were in the 2017 season, and, if that date is too much to hope for, we look forward to its return in a couple of years from now. Not only is it remarkable for its swinging from chronicle to a more contemporary narrative form while the rawness of the music, on the cusp of pre-Christian times, also shifts in the second half – or at least that is my memory, the uncertainty of which is why it commands multiple viewings. Here, on a larger canvas is the savagery in Dragon’s Return or of Bergman’s The Virgin Spring and The Seventh Seal, though quite different because of the energies that come from the scale of Marketa Lazarova. These remarks give some sense of what energises the three hours, but they are so many and so deftly portrayed in the recreated settings that it is impossible to say more after a single viewing. What would I like to see at future Festivals? The new movies for next year are still in production and so we have to rely on the Festival committee to keep up and to provide a range as broad as this time – with the hope that they are never tempted to follow the French and Italian Festivals into ever more rom-coms, coming-of-age and “aging gracelessly” films. From the past, I have only one specific film to suggest, Little Otik, a puppet in the spirit of Roald Dahl, which I saw at ARC a few years back and have raved about ever since. The tradition of puppetry of every kind is something I associate with the visits by the Black Theatre of Prague. Surely there are films of opera productions, of Janáček at the National Theatre Brno? Documentaries, past or present, about the court of Rudolf and the intricacies of Arcimboldo? Is it possible that no Kafka has been adapted in his homeland? And what survives from the pre-talkie era? I know I am stretching matters here but several years ago we missed a doco about Serbian painters working in Prague from 1890 to 1940 that had screened at a Serbian Festival, which we did not hear about until it had closed. My interest in Serbian painters is somewhat less than my appetite for actuality footage of Prague pre-1940. Meanwhile, there are the opera, theatre and art transmissions as we pick our way through the Russian (Nevsky), British (Loach), Iranian (A Dragon Arrives! ), Jewish (Stefan Zweig), Greek (Z) and German (Varieté) Festivals. There is no way that we can afford the time to go even to six from each, let alone to all of the offerings, as we did for the Czech-Slovak one – and doubtless we are missing much that is worthwhile – yet it is difficult to believe that we would score so high a success rate as we did at the Czech and Slovak Film Festival. Editor’s note – Little Otik screened at the 2014 Czech and Slovak Film Festival – sorry, Humphrey! Humphrey McQueen is an historian, author and cultural commentator who has written prolifically on politics, the media and the visual arts. His publications include The Black Swan of Trespass: The Emergence of Modernist Painting in Australia to 1944 (1979); Gallipoli to Petrov: Arguing with Australian History (1989); Temper Democratic: How Exceptional is Australia? (1998), and The Essence of Capitalism: The Origins of our Future (2001). He collaborated with Peter Lyssiotis on the limited edition artist book Men of Flowers (2010).